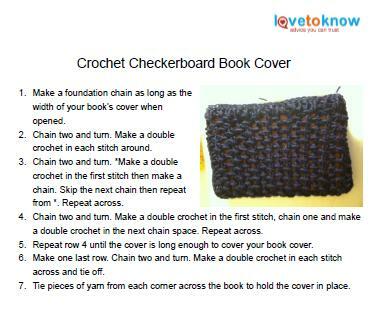 Crocheted book covers are a stylish way to protect books. The patterns are all worked in rows and designed to be custom-fit for your favorite books. Be sure to have the book you want to cover handy so you can check the fit as you work. Each pattern is made with medium weight yarn and a 5mm crochet hook. Beginners should be able to handle these patterns as they use only basic stitches. To access these patterns, click on the image of the pattern you want to open the corresponding .pdf file. From there you can save the pattern to your computer or print it out. This pattern is perfect for a masculine looking book cover. Checkerboard patterns are not difficult to make as long as you know how to do single and double crochet stitches. Click here for this pattern. Women who love to read will adore this lacy book cover. It has a nice feminine touch to it and dresses up any book. The lace look is achieved by creating space between the stitches. 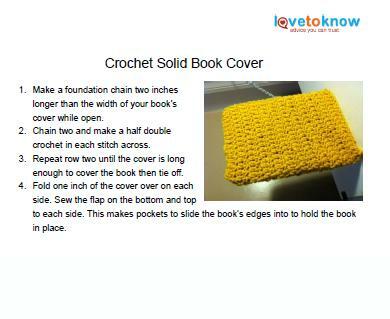 This solid crochet book cover provides attractive protection for your books. 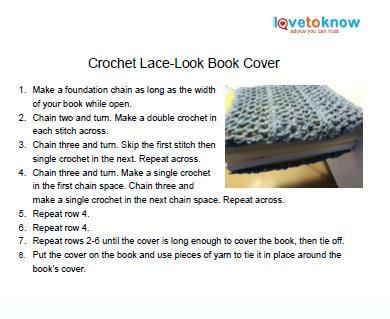 The look is achieved by using chain and half double crochet stitches. Make your book cover thinner by using a smaller hook and finer weight yarn. Add buttons, beads, or crocheted motifs like flowers to decorate your cover. Make a strap from Velcro for your book cover. For a more permanent cover, glue your work to the book instead of tying it. This is ideal for journals and other keepsake books. 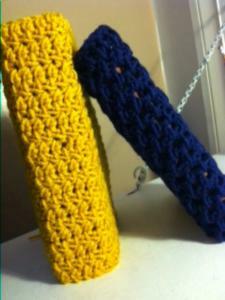 Crochet book covers protect your books and add a touch of style. They are a unique way to cover your favorite books and make a perfect gift for the book lover in your life. The next time you give a book away, craft a cover as part of the gift.